Mother and motherland are superior even to heaven. An Indian Patriot is ever ready to lay down his life in the service of his country, India. Patriotism is not mere passive love for the country. A true patriot, who loves India, is an active worker. He works at heart and soul for the progress of his India and countrymen. Patriotism inspires a patriot to rise in revolt and fight for the freedom of his country. In a free country like India, there are occasions when one has to sacrifice one’s personal pleasures and even life for one’s country. A patriot always fights against the internal and external enemies of his country. The black marketers, profiteers, criminals and anti-socials are all internal enemies of India. A true Indian patriot tries to free his country from all these enemies. He also must try to make his India free from poverty, ignorance and superstition. Some of the most glorious chapters of Indian history have been written in the blood of patriots. RanaPratap, Tipoo Sultan, ShivajiMaharaj, Surya Sen, Netaji, Jatin Das — all of them are great patriots to be remembered. Their patriotism is different from false patriotism which is a danger to a nation and civilization as a whole. A true patriot loves other countries as his own and wants to live in peace with them. He does not think his country to be the best in the world. The feeling of Patriotism is important for the Freedom of a Country. A patriotic person will always be ready to sacrifice his life for the love for his country. A Patriot is immortal. Men love their own country. They do many things for the good of the country. This feeling for their country is called patriotism. Patriotism is one of the best virtues of man. It is a noble feeling of the mind. It is said that mother and motherland are superior to heaven. Most men have got love for their country. They wish to make their native land free. Some are ready to sacrifice their own interests for the good of the country. A selfish man cannot love his native country. A selfish man may be rich; he may he born in a noble family; he may have a big title, but nobody will respect him. After his death, he is forgotten by all. He is sometimes an enemy to the country. He seeks his own interest. He can even do harm to the country for his own interest. But everybody praises a patriot. A patriot is immortal. He is worshiped by his countrymen. He is honored all over the world. Every one of us knows the name of Shri Chatrapati Shivaji Maharaj. He was a king. But he suffered great hardship for his country. He sacrificed everything for the freedom of his country. He was a great patriot. He earned an immortal name by his self-sacrifice. Many patriots lost their all, even their lives for the good of the country. But they gained one thing. They won the hearts of their countrymen. Patriotism refers to the feeling of devotion and support towards one’s own country. It is, indeed, difficult to imagine a man who does not love his own country or who is not patriotic. We love what we call our own — our life, home, our family and our friends. But most of these things belong to our country. It is in our country that we are born, it is there that we live, its aspirations are our aspirations and its sorrows are our sorrows. We love it before we are aware of this love. It is a deep, secret, often unconscious sympathy that every man feels for his country. Let us imagine a man who does not love his country. It is very difficult to say what he will call his own. He may wander over other lands and call himself a citizen of the world. But he will feel that everywhere he is like a fish out of water. The people of the different countries are none of them his enemies, but none will be his friend either. He will feel that he has acquaintances everywhere and friends nowhere. He cannot be expected to have deep attachment to anything. It is likely that he will love only his own self, and he will find that no one trusts him. One’s own native land is like one’s mother; both are superior to heaven. It is only reasonable that the freedom of one’s native land should be regarded as one’s dearest possession, because if a man’s country is not free, his own freedom is restricted in a hundred ways. He is like a bird in a cage; the cage may be of iron or of gold, but it is a cage all the same. If he is in a free country, he may have many ills but he knows that he is in a way responsible for these ills and must work along with his fellows so that these might be removed. There is joy in this work, because there is freedom. Patriotism does not mean simply using poetical expressions about the motherland or even dying for her. We must die for our country when the need arises but we must live for her too. We must work to make her strong, for the strength of a country is the strength of her people. Love for the country thus reduces itself to love for the people. Their sufferings we must try to remove and their happiness we must promote. We, all of us, look after our own good, and it is natural that we should do so. But we must see that we do not enrich ourselves at the cost of the country. If we evade paying taxes, if we travel without ticket, if we sell bad food, it is our country that we cheat; it is our people that we harm. In India such patriotism and such patriots are badly wanted now. Mahatma Gandhi invoked the patriotic zeal of Indians, and hundreds of thousands of men flocked to his banner in the struggle for freedom. Many of them died in the struggle, courting death bravely, some directly under his guidance others in the ways of armed revolt. All of those who joined the struggle had to make sacrifices. It was a heroic record of which any country would be proud. Conditions have changed now, lot of improvement have been seen in India since new patriot (Narendra Modi — Prime Minster) stormed into power. It is not an alien power that we have to fight now, but the evil in us and around us. The hungry millions have to be fed, clothed and educated. India must produce her own food and make herself great in trade and commerce and rich in industrial output. This requires determined and unselfish endeavor. In addition to satisfying our own needs we have to look after the refugees who have been driven to our land from their homelands. We shall have to share our land and our food with them. This is a difficult program, but patriotic India must be equal to it. Patriotism is good but it is not enough. Although we should love our country, we must have no ill-feeling for others. There must be no desire to make them serve our ends, to exploit them for our good. Above all, we must have perfect openness of mind; we should love what is good in us but we should accept what is good in others. We should have love and goodwill for other countries. We should be citizens of our country by all means, but we must be citizens of the world, too. Even current prime minister of India Narendra Modi is trying hard to develop his nation with his proven leadership skills and practical experience in developing the India. There are a lot of people, who don’t like patriots like Narendra Modi who wanted to change the India. In short, people are confused while interpreting the meaning of leadership. Indian people always expect immediate change even they don’t care who is what and the background of leader. 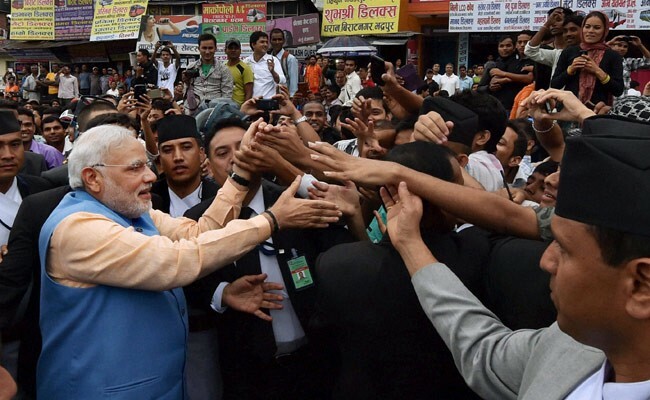 Prime Minister Narendra Modi greets people on the streets on his way back to the hotel in Kathmandu on August 3, 2014. Very few leaders across the globe are coming from lower class economical background, which includes Barack Obama (Ex — President of America) & then Narendra Modi (Prime Minister of India) both are the most influential leader in the list of top leaders of 100 worldwide). When Modi stormed into power in 2014 by winning Lok Sabha election with massive mandate, he delivered a strong message: “We are not here for any positions but for a responsibility”. From bureaucrats to MPs, everyone started falling in line. Be it strengthening foreign policy or launching welfare schemes for low-income group, team Modi has been working hard to fulfill people’s expectations. Here are 11 major things Modi government has implemented since coming to power — that’s called patriotism (A tea seller who is having determination for new India since longtime). Swachh Bharat Abhiyan was launched on 2 Oct 2014 by Modi. Filth is considered one of the major problems in India and Modi gave the issue its due importance by launching a nationwide campaign. Many called it a masterstroke from Modi as it put him at par with Mahatma Gandhi in public perception and also gave people the message to act on hygiene and civic sense. Modi nominated notable personalities from film industry, sports, media, business and other celebrities to promote the initiative. To facilitate investment, boost research & development (R&D), ensure product originality and create skill-based jobs by establishing industrial sector; major national programme was started by Narendra Modi. Modi has reached out to the world with his idea of ‘Make in India’ and it has generated positive response from foreign companies. Key Labour Law reform in the pipeline will boost manufacturing industry and foreign investment in India. On 15 August 2014, Modi announced Jan Dhan Yojana. Over 15 crore bank accounts were opened in last one year. Main focus has been on reaching every household to provide credit facility, pension and insurance to account holders. On 1 Jan 2015, Modi formed National Institution of Transforming India (NITI) Aayog, which is a policy think-tank of Government of India that replaced Planning Commission. The panel was abolished along with GOMs and EGOMs which caused policy paralysis under UPA rule. NITI Aayog is headed by PM Modi and its members include top-notch economists, consultants and advisers along the lines of US think-tanks. Modi-led NDA government’s primary focus is on reviving Indian economy through major reforms in manufacturing and export sector. Government has not only increased the limits of FDI in Railways, Insurance and Defence but also encouraged privatization of loss-making public sector companies. Modi’s foreign policy is currently focused on improving relations with neighboring countries and getting the world to invest in India. In the US, he met several American business leaders and invited them to be a part of Make in India program. During his recent visit to France, he urged Airbus, the aerospace giant, to explore manufacturing opportunities in India. While in Germany, he made a strong pitch for the Make in India initiative. He has been trying to send across the message of a more “competitive, confident and secure” India. One of the major policy initiatives taken by Modi government was to actively focus on improving ties with immediate neighbours. Inviting all heads of SAARC nations to Modi’s swearing-in ceremony was an aggressive and smart move by Modi as a Prime Minister. It gave the bold message to the World that no one does swearing-in in Asia like we do. It was the first diplomatic victory for Modi and India started taking itself seriously again. Tourism featured prominently in the government’s action plan. Its prime target has been to make India a world class travel destination. In last one year, the visa system underwent a major revamp. Introduction of visa-on-arrival service for all leading nations was a key step in this direction. 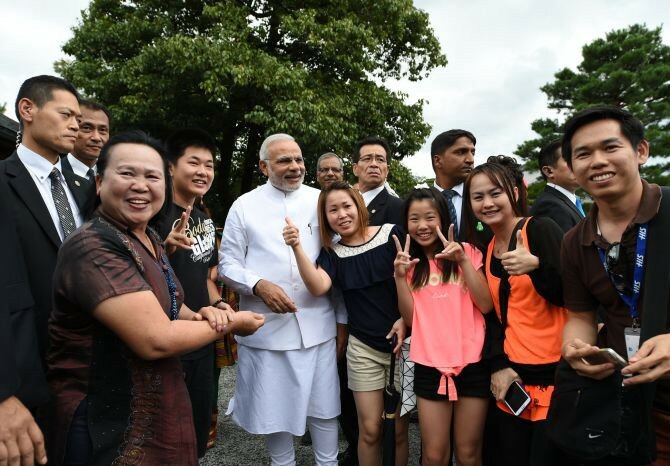 Moreover, growth has been reportedly observed in the number of foreign tourist arrivals after the Modi government came to power. PM Modi has initiated a huge project to construct 10 crore toilets by 2019 at an unbelievable rate of one toilet per second. Modi appealed to corporate sector for contribution in this Clean India drive. Positive response has come from IT giant TCS and they have decided to build 10,000 toilets in girls’ schools across the country. An enormous fund of 100 crore has been provisioned for this cause. Oriental Bank of Commerce has announced contribution of 2 crore for building toilets. Bharti Foundation, Adani Group, Reliance Group and Vedanta Group have also pledged support for the campaign and contributed significantly. Kashmir is an integral part of India but has a long list of complaints against previous governments — both Centre and State. When the flood created devastation in the valley, response from Modi government was immediate and genuine. Modi dedicated constant monitoring system for flood affected areas and people of Kashmir. He also decided to spend Deepawali with Kashmir flood survivors. Even his critics praised his move. After a long time an Indian politician managed to establish a connect with the Kashmiri people. One of the recent initiative as people are claiming that great move for Indian economy for long term benefits. On 8th November 2016, the Government of India announced the demonetisation, commonly called notebandi, of all ₹500 (US$7.80) and ₹1,000 (US$16) banknotes of the Mahatma Gandhi Series. The government claimed that the action would curtail the shadow economy and crack down on the use of illicit and counterfeit cash to fund illegal activity and terrorism.The sudden nature of the announcement — and the prolonged cash shortages in the weeks that followed — created significant disruption throughout the economy, threatening economic output. Beti Bachao Beti Padhao Scheme Skill India. What else a patriot can do for his nation, he have done his marvelous work and still doing his best to make India free from corruption as none of prime minister done this before. Modi is a different kind of Prime minister of India had ever witnessed. Any one will love such a leader who is a man of great qualities. His dedication, commitment, smartness, effective use of resources and hard working nature makes him a role model for many. He is not the man of words he is the Man of Action. After the Modi government came the inflation had come down to around 5% while revised gross domestic product (GDP) data had a growth at 7.4% and this will help India to be better than China even. Even World Bank Group President Jim Yong Kim found the policies and work of Indian PM Narendra Modi visionary. Sarva Shiksha Abhiyan • Education for all: Smriti Irani’s big challenge • Schemes Launched by Modi Govt Start-up India, Stand-up India • Gram Uday Se Bharat Uday Abhiyan • Mantri Ujwala Yojna Sukanya Samriddhi Account • Pradhan Mantri Jeevan Jyoti Bima Yojana (PMJJBY) • Pradhan Mantri Suraksha Bima Yojana (PMSBY) • Pradhan Mantri Kaushal Vikas Yojana • Pradhan Mantri Krishi Sinchai Yojana Pradhan Mantri Awas Yojana (PMAY) • One Rank One Pension Scheme • Seventh Pay Commission • All Information about Digital India Programme • eBasta — Features and Benefit for students • Atal Mission for Rejuvenation and Urban Transformation • Mahatma Gandhi National Rural Employment Guarantee Act (MGNREGA) Beti Bachao Beti Padhao Scheme Skill India. Previous 4 Chefs that Have Made India Proud!